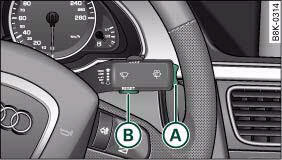 • The displays for fuel consumption (average and current consumption), fuel range and speed are shown in metric units. You can change the measurement units via the sound system or MMI*. Press RESET button B ⇒ fig. 20 to switch back and forward between the functions of on-board computers 1 and 2. The number in the display, fig. 19 indicates which of the two memories is currently in use. The figure 1 means that the display is showing the information in the single journey memory (on-board computer 1). The figure 2 means that the display is showing the information in the total journey memory (on-board computer 2). The on-board computer is controlled by means of two switches on the windscreen wiper lever. – Press the top or bottom of the function selector switch A ⇒ fig. 20. 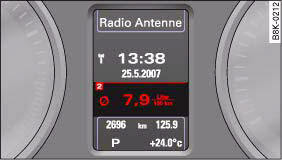 This displays the on-board computer readouts one after the other. The on-board computer can only be operated while the ignition is switched on. When the ignition is switched on, the display shows the function that was last selected. 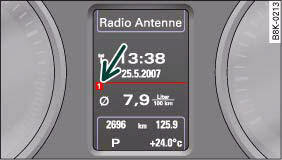 As well as the figures from the on-board computer (computer 1 or 2), the display can also show information from other systems. Press the Reset button B briefly to switch back and forward between these displays. You can also cancel all the values in the single journey memory or the total journey memory at the same time. The information in the memory is cancelled if the battery is disconnected. The basic settings for the on-board computer can be adjusted via the sound system or MMI*. – Select: Function selector button CAR > Instrument cluster > On-board computer 1 or On-board computer 2. You can zero all the values in the single journey memory or the total journey memory at the same time by selecting the Reset menu item. 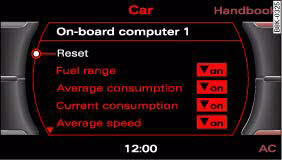 You can also define which items of information you wish to have displayed by the on-board computer. If one of these items is switched off, it will not appear in the display. However, the corresponding figures will still be registered by the on-board computer and can be switched back on at any time so that they again appear in the display.